Maintaining the co-ordination between ministry of Education and National Institute of Education related to education procedures of schools. 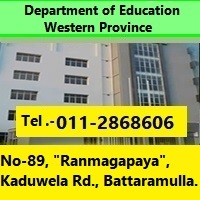 Conducting and Developing special education and non-formal education programmes and conducting compulsory education orders. Giving free text books, school uniform and lunch for school children. Conducting health improvement and nutritive programmes. Providing scholarships for scholarship holders. Conducting relavant teacher training programmes in order to implement the school curriculum. Prepairing students for National Level Examinations. Conducting professional development activities for teachers. Goverment and non-goverment co-ordination related to Education development.